Published: Oct. 31, 2011 at 06:16 p.m. Updated: Oct. 31, 2011 at 06:27 p.m.
Who were the biggest winners and losers in fantasy football this weekend? Here is a look back at the weekend that was. 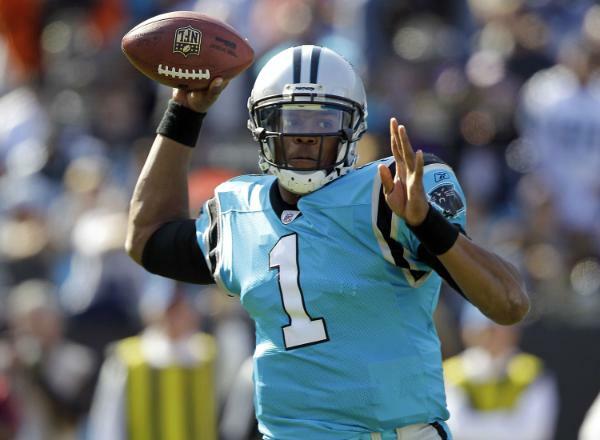 Newton has clawed into the mix for must-start fantasy quarterbacks. But if you have him on your bench behind Tom Brady, Aaron Rodgers or Drew Brees, you should start trying to make a deal to improve other parts of your team, because he can't help you from the bench. Believe it or not, there were people who thought Sunday's game was going to be a 'trap game' for the Lions and left Stafford on the bench. Seriously, there were people who thought this. Stafford had one of his best games of the season with 24.78 points. Brees is in the must-start category and coming off a huge win coupled with a tasty matchup against the St. Louis FC, this seemed like it would be a monster game for Brees. But he managed only 10 points, and while not the worst performance by a starting quarterback on Sunday, this one hurt the worst. There are those who feel that McCoy's final touchdown against the Cowboys was a touch excessive - especially if you were going against McCoy on Sunday night, like yours truly. But there is no doubting that McCoy put in the performance of the day. Let's give credit to Jackson for pulling himself off the fantasy scrapheap with a monster performance -- easily the best of the day heading into Sunday night. And it should be viewed as no small coincidence that Jackson did so well in those old-school uniforms. Hopefully the team will break these back out when it returns to Los Angeles. The joke went, "If Johnson can't turn it around against the Colts, he is never going to." Turns out the joke was on us. Another dismal performance, Johnson is fighting to stay off the waiver wire for most people. Now, I can't advise you do something that drastic, but he has clearly moved past his "must-start" status. Receiver numbers are on the decline, but Johnson still continues to put up mega numbers. Johnson had 125 yards and a touchdown to lead all fantasy receivers with 18.50 points. Here's a newsflash for all of you, if your No. 1 receiver is going up against Nnamdi Asomugha, be sure to sit him. Asomugha claimed another fantasy victim after he held Austin to just 27 receiving yards. But don't worry, Austin should bounce back next week against the Seahawks. Having to grab a tight end off the waiver wire at the last minute on Sunday morning is the worst. You are lucky, and I mean lucky, if you get five points from the guy. A touchdown is unbelievable. But those who took a chance on Chandler were rewarded with 15.50 fantasy points thanks to two scores from Chandler. This was an absolute joke. Gresham was a last-second scratch against the Seahawks, leaving many fantasy owners to scramble for a replacement. Well, that is if you could add a guy after the 1 p.m. local start in Seattle. A lot of rosters close following the kickoff of the 10 a.m. game. The old adage is that Tebow just scores fantasy points. Turns out the same applies to defenses going against Tebow, who was very generous with the football. Tebow lost a fumble that was returned for a touchdown, threw a pick six and was lousy enough for the Lions to put up 29 fantasy points. Alright, you are playing Blaine Gabbert and you still only manage six fantasy points? That is not a good fantasy day. You could have started the Jaguars against the Texans and received just as many points.